Lower back pain is one of the most common injuries among adults. Whether it’s minor or severe, it’s not something that should be ignored. Although you might be tempted to stay in bed and rest, doing strengthening exercises can actually help you recover faster. If you are feeling symptoms such as dull pain or aches in the lower back, muscle spasms, tightness, pain after standing or sitting for a long time, or limited range of motion in your lower spine, you could be suffering from a lower back injury such as a sprain or strain. In some cases, lower back injuries may heal on their own, but you can help the process along by building strength and flexibility in the back muscles. Whether you’re just starting to feel the twinge of pain or are recovering from a strain, these six lower back injury exercises may help you build strength and regain range of motion. Although it’s generally safe to try these at home, if you feel pain while doing these exercises, consult with a professional to ensure that you are using proper form. Extension Exercise or Bridges While lying on your back, bend your knees and keep your feet flat on the floor. Squeeze the buttock muscles then lift your hips off of the ground, making sure to keep your abdominal muscles tight. Hold briefly, then lower your hips slowly back down to starting position. The hamstrings play a major support role in core and back strength. Keeping them limber allows you to have greater range of motion and can help reduce lower back pain. While lying flat on the floor with knees bent, extend one leg straight toward the ceiling. Gently hold your leg behind the calf or use a towel wrapped around the foot to gently pull your leg toward your body. Remember to breathe while you hold the stretch. From the same position on the floor, you can gently stretch the lower back with a knee-to-chest exercise. Keeping both knees bent, lift one leg and bring your knee toward your chest. Slowly lower your leg back to the floor, and do the same stretch on the opposite side. Continue to alternate and hold each stretch for up to 30 seconds. While still lying on the floor with knees bent, tilt your pelvis toward the ceiling, pause, and gently lower it back to the floor. Tucking the tailbone and engaging the abdominal muscles is important for this exercise, so try to avoid squeezing too much in the gluteal muscles. With both legs flat on the floor, bring your right knee in toward your chest, and extend your right arm out to the side so it is flat on the floor. Keeping your arm and shoulders on the floor, use your left hand to gently pull your right knee across your body and toward the floor on the opposite side to create a twist in your lower back. Repeat on the opposite side. Starting on your hands and knees, move the knees apart until they are just wider than your shoulders, and bring your feet closer together. From this position, bring your hips back toward your feet as you lengthen your arms forward. If you are flexible enough, sit on your heels, and if not, just go as far as you comfortably can. Relax into the stretch, and hold it for up to two minutes. Sometimes poor posture is the cause of lower back pain. To combat slouching, do a front-to-back shoulder squeeze. Start in a standing position with your feet just wider than your shoulders. With straight arms, interlace your fingers behind your back and gently lift your arms away from your body while keeping your back and legs straight. Do a similar stretch to the front by crossing your wrists, bringing your palms together, and rounding the shoulders to stretch the upper back. 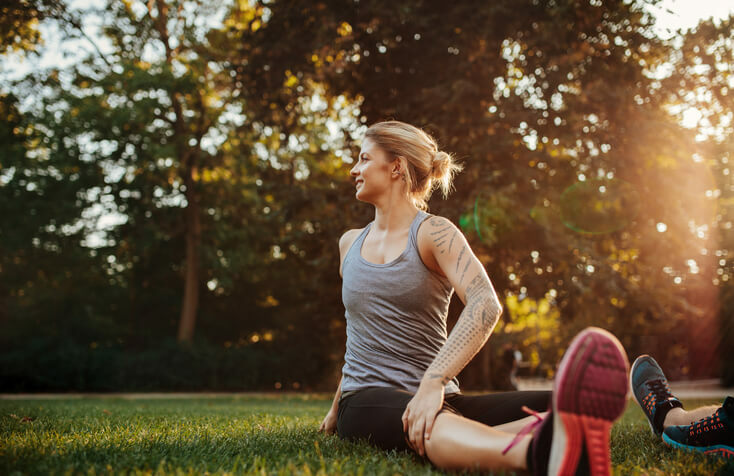 Although it’s a good idea to stretch and strengthen the lower back muscles while recovering from an injury, there are a few exercises you should avoid because they may create too much stress. If you’re feeling lower back pain, or if you do not have the core strength to do these exercises without causing pain, you should avoid them. Bending at the waist from a standing position stretches the lower back muscles, but this exercise often stretches them too far, potentially leading to an injury or making an existing one worse. This old-school exercise is a go-to for many people who want to strengthen the core, but if you have lower back pain, this is one to avoid. A sit-up is a forward bend, much like a toe touch. If you have weakness in the lower back muscles, a full sit-up may cause them to overextend. Leg lifts are yet another exercise that can cause hyperflexion or overextension in the lower back muscles. This one can be even more risky because you have the added strain of trying to lift the weight of the legs at the same time. If you’re feeling back pain, even if you can normally do this exercise, skip it until you recover fully. For more information about safely recovering from a lower back injury, download our free Complete Guide to a Faster Spinal and Back Injury Recovery.